As is known to us, based in Berlin, Germany, SoundCloud is an online video audio distribution platform which enables its users to upload, record, promote and share their originally-created sounds. According to official statistics, it had 40 million registered users and 200 million listeners in worldwide until July 2013. The supported audio formats for uploading include AIFF, WAVE, FLAC, OGG, MP2, MP3, AAC. Once you registered, you can share tracks on SoundCloud as you like or plan your next worldwide release as well as other artists. Without question, there are many latest amazing tracks on SoundCloud, which are deserved to add to playlist for reviewing at any time. But, it is inconvenient for you if there is lack of network or your devices don't support such connectivity when you want to replay those classic SoundCloud songs. For keeping you out of this kind of embarrassment, honestly, you need the help from SoundCloud recorder like MacX Video Converter Pro or SoundCloud music downloader. Sometimes, people choose download SoundCloud music files rather than record music from SoundCloud because they believe it would be more simple and efficient. It is no doubt that online music downloading tools including SoundCloud-Download, SoundCloud File, Anything2MP3 are easy to found and will save much installation trouble. Users just need paste the desired URL to the dialogue box at the website and directly hit "Download". It looks like so perfect for SoundCloud fans. On the contrary, they will bring you much inconvenience, for example, all of these tools don't allow you to choose sound quality and audio formats before downloading; they only support download music from SoundCloud and they are failed when downloading songs from other websites, for example, free download YouTube music video will fail; there isn't audio conversion service for you so that you have to find a converting software after finishing download process; etc. However, those limitations make you feel so desperate because finding an alternative way to obtain tracks from SoundCloud is a tough work. And why don't you try to capture SoundCloud with SoundCloud recorder? 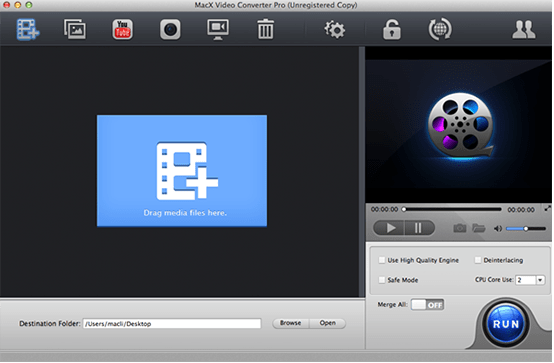 Designed especially for Mac users, MacX Video Converter Pro, called as the best tool to convert YouTube to MP3 with high quality, enables everyone to freely record SoundCloud on Mac (El Capitan included) with original audio quality. More surprisingly, it can help you to convert SoundCloud music to any audio format you need, like MP3, ACC, AC3, WMA, WAV, iPhone Ringtone, DTS, OGG, etc. with lossless audio quality. Thus, you can enjoy any SoundCloud music tracks on your iPhone iPad Android devices or other media players without any concern about network connection and incompatible problems. For purpose of successfully record tracks from SoundCloud, the primary task is installing this screen recorder for Mac on your Mac OS X computer. Step 1: Hit "Screen Recorder" Button. In the pop-out "screen recorder" dialog box, you are allowed to customize the SoundCloud recording settings like audio device, Max Framerate, Record Region, etc. Notes: In order to smoothly and normally record music songs from SoundCloud, you'd better not to adjust the audio settings in case the unexpected heightened volume would hurt your hearing. Select a destination folder to save your downloaded SoundCloud music files by clicking "Target Folder" button. Step 4: Start Capture SoundCloud on Mac. Click "Start Record" button to start record SoundCloud on Mac at fast speed. By the way, make sure there isn't any other useless audio to disturb in the process of recording music. And you also can stop recording at any time for making ringtone for mobile phones. The same applies to record music from Pandora, Spotify, Grooveshark, etc. music streaming service. Warm note: If the creator has licensed about original music for free downloading, then you can free download music for personal use from SoundCloud. But, if somebody has illegally uploaded commercial music without permission of the copyright holder, on this occasion, you cannot download it for keeping yourself away from copyright infringement.